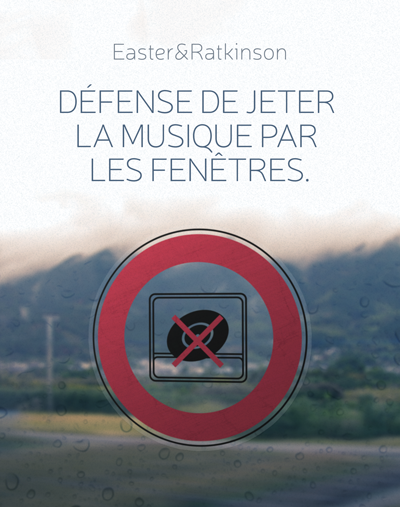 Défense de jeter la musique par les fenêtres. Sei seduto in treno e guardi dalla finestra. Il paesaggio ti passa davanti. È sera, il sole sta per tramontare, gli alberi proiettano lunghe ombre sul terreno. Di tanto in tanto case, persone, macchine. Poi montagne, alberi e il cielo che si scurisce. Easter&Ratkinson ti accompagnano con la loro colonna sonora. Non sai se sia la luce o la musica, ma qualcosa rende questo viaggio molto particolare. You're sitting in a train, watching the landscape passing by the window. It's evening, the sun is about to set, the trees throw long shadows. From time to time, houses, people and cars. Then more trees, the mountains, and the darkening sky. Easter&Ratkinson play their soundtrack to it. You don't know if it's because of the light, or the music, but it's a very peculiar voyage.